Walking barefoot connects you with the earth, lets you feel every single step you take, makes you conscious of where you walk to avoid stepping on something unpleasant. You can’t walk barefoot outside without having your mind on the sensation. It’s like seeing the ground in extreme detail through your feet. Every pebble, every crack in the sidewalk, the soft coolness of grass, the heat radiating from sun-warmed pavement, the resistance of rock, the yielding of sand. 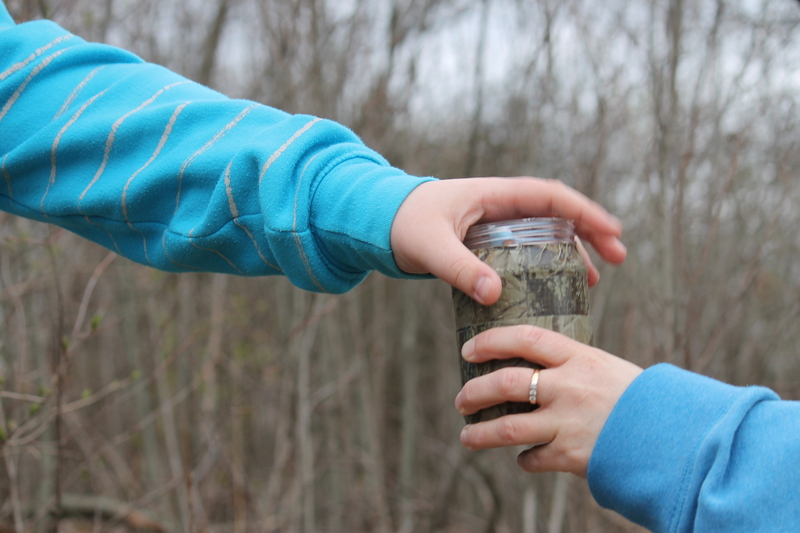 The passing of the geocache. It’s like being Indiana Jones without the bad guys chasing you. Finding clues, searching for treasures, opening containers to see what others have left – it’s SO fun! I find that when my little posse and I go geocaching, we seem to be very ‘in the moment’. Each little step or discovery that gets us closer to our find is so exciting. Watching my son find a cache, talking about where we think the clues are leading, searching through the cache once it’s found and looking at each article, deciding what we’ll leave behind for the next treasure hunters – it’s always an adventure and we never miss a moment of it as it happens. I make a point of enjoying each grape that I squish in my mouth. I bite down just enough to crack the skin, then kind of stick my tongue in and turn it inside out so that the next bite is a crazy splash of juicy, grapey goodness. I love yoga. I really do. But I have to admit that my favourite part is the ending when we lay there and relax. It’s unbelievable to me that doing ‘nothing’ could feel that amazing. The whole class feels good, but the relaxation, integration and inner focus is so centering and energizing. Afterward I feel like I’m back on track, fresh and balanced and renewed. There’s just nothing like it. 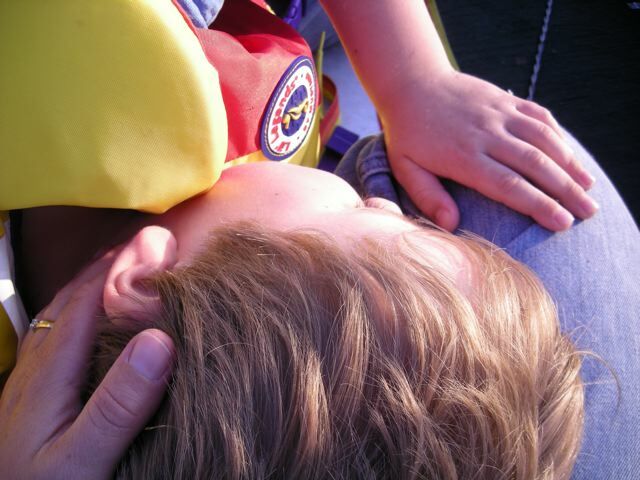 My little guy taking a rest on my lap during a ride up the creek. Being close to another person, close enough that cuddling is something you do together, is one of the best things in the world. The warmth of your co-cuddler, their smell, the fact that they find comfort in being close to you as well. It’s hard not to pay attention to that. So….can I apply my ability to be in the now to other situations? If I can eat grapes mindfully, then why do I stuff popcorn in my face? Perhaps I could use my grape-eating mindset when eating popcorn, enjoying each kernel, feeling its texture and fully tasting its salty, buttery deliciousness as it dissolves in my mouth. (Ok, I think I can see why I inhale it.) If I can live each moment of geocaching, why not try to be fully present while grocery shopping? Can I smell the freshly baked bread as I pass the bakery? Do I feel the chill of the coolers in the dairy aisle? Do I realize how many germs are on the handle of my grocery cart? After much practice and training of your mind, do you think it becomes easier to slip into being mindful and present on a regular basis? When are you the most mindful? Two great books for you on living mindfully: Full Catastrophe Living and Infinite Self. Thanks! I’ll look them up. I’m also currently expecting the arrival of ‘Why is the Buddha Smiling?’ – another great book on mindfulness. Oh, and thanks for the reminder. Living mindfully takes practice. And it helps to be reminded to practice. So much practice. I’m getting the feeling that the main part of being mindful is just remembering to remember. I love Savasana – it would be awesome if all students were like you. I had people getting up and leaving, thinking that it’s a “waste of time” as you’re “doing nothing”. Really?! At the end of class I often find a similar thought popping into my head: “I could easily get addicted to this!” It’s too bad that they’re missing out on such an amazing experience. And it’s so important to the practice – I can’t imagine what it would be like to skip it.